The spectacular Mozambique Islands are made up of the Bazaruto Archipelago, Inhaca Island, Ilhe de Mozambique and the Quirimbas. With pristine beaches and an abundance of marine life – this group of islands attracts travellers from all over the world. Whether you are seeking adventure, luxury or relaxation, Mozambique Travel.com offers an excellent array of Mozambique accommodation mpackages for 2019 including fishing, dhow, and sailing activities in the Indian Ocean Islands. 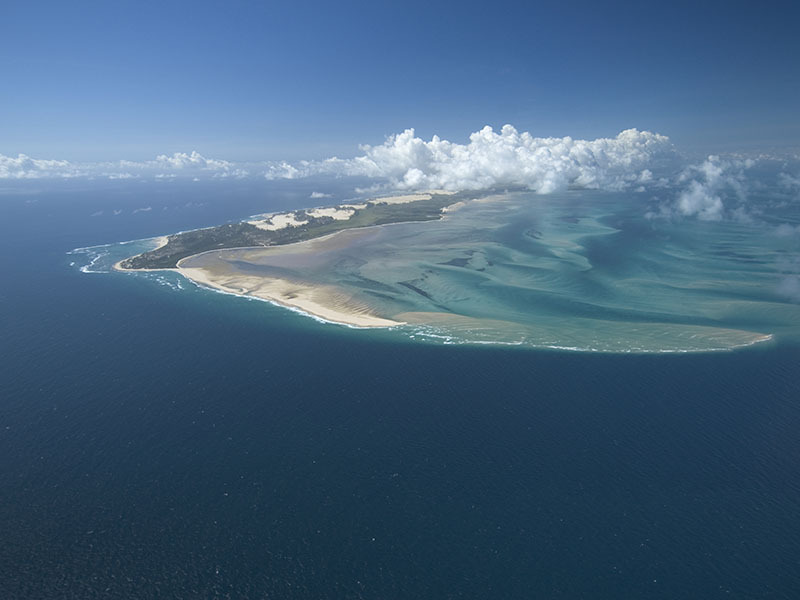 The most popular tourist area in Mozambique, the archipelago consists of four main islands – Bazaruto, Benguera, Magaruque, and Santa Carolina. These islands are situated some 35 km off the mainland and are accessible by boat, or small aircraft from the town of Vilanculos. The Bazaruto Archipelago is truly one of the most beautiful destinations on the planet and high quality, luxury accommodation in this area of Mozambique Islands attracts international visitors. As well as swimming and sunbathing, visitors to the islands can take part in a full range of water-sports that includes snorkelling, scuba diving, deep-sea fishing, saltwater fly fishing, sailing and water-skiing. The spectacular coral reef’s and crystal clear waters offer some of the best diving in the world. Small antelope roam the islands alongside fresh-water crocodiles, mangrove crabs and Samango monkeys while flamingoes nest on the freshwater lakes. The islands are home to over 240 varieties of birds including fish eagles, bee-eaters, harriers, ospreys and the elusive crab plover and green coucal. Bazaruto Marine Park now covers the entire Bazaruto Archipelago making this 1400 sq km reserve one of the largest in the Indian Ocean. In addition to humpback whales, dolphins, manta rays and five species of turtle, some 100 Dugongs survive here – one of the very few viable populations on the East African coast. Quirimbas Archipelago and Island of Mozambique, and a former Portuguese trading post, this beautiful island has been nominated for World Heritage status. Only accessible by boat from Pemba, it is well worth the effort as the island is steeped in history and ancient culture. A number of investors have identified this and community and conservation projects are underway to protect Ibo’s biodiversity. Located in the awesome Quirimbas of northern Mozambique Islands, and nominated for World Heritage status, Ibo is an island that is remote and untouched by large-scale commercial developments and today is one of the most fascinating, idyllic, African islands you could dream of visiting. The island prides itself on its three historical forts. The largest, St Jao Baptista on the northern side of the island, was used to imprison political prisoners from Portugal as late as the 1970’s. Today the fort is used for more peaceful work and is home to traditional silversmiths that practice their ancient art of handmade jewellery design. About 34 km out into Maputo Bay, Inhaca Island is accessible either by boat or light aircraft. The lovely island offers many different activities including a tractor ride to the lighthouse or a visit to the Marine Biology Museum. Scuba diving, snorkelling, kayaking, parasailing, windsurfing and surf or deep-sea fishing are just some of the more exciting activities. Inhaca Island is home to approximately 300 bird species and 160 coral species. Whale sharks and Manta rays visit in summer while Humpback whales migrate seasonally past these shores. An excursion to neighbouring Portuguese Island or an escape to the ‘wild side’ of the Mozambique Islands – with its crashing surf, deep blue sea and glorious wind – are also recommended. The abundant wildlife includes flamingo, pelicans and loggerhead turtles. Wander along the dusty streets of this gracefully crumbling town where children play in the street and women chat in cool of the shuttered villas. Experiencing this you feel as though you have stepped back into a bygone era. Now a World Heritage Site, this former capital of Portuguese East Africa was a trading post, for gold, ivory and slaves, used by Portuguese ships on their way to India. The old part of the island is full of historical and architectural features. Numerous buildings, some constructed of coral, date from the 16th century. Consisting of 32 small islands, including Ibo Island, and stretching 100 km from Pemba to the Rovuma River on the border with Tanzania, the area boasts some of the richest coral reefs in the world and is home to an abundant array of marine life. Luxury lodges in Mozambique Islands provide ample opportunity for relaxation while scuba diving, snorkelling, deep-sea fishing, sailing, surf-casting and bird watching are just some of the activities on offer. The southernmost of the islands and a vast expanse of mainland forest form the recently declared Quirimbas National Park. Elephant, leopard, lion, buffalo, wild dog and an amazing bird-life may be seen here while the marine fauna and flora include sharks, sea turtles, humpback whales, the occasional dugong and over 50 types of coral.